We kicked ourselves for not having sought out a theater to see Werner Herzog's Cave of Forgotten Dreams in 3-D when it first came out. As is so often the case, we waited too long--trusting that it would be around for a while... until it wasn't. Now that the film is available on Netflix, we settled for a television screen. 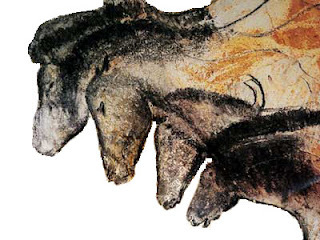 Even in much smaller scale and in 2-D, it is an amazing experience to venture with Herzog and his tiny crew into the only recently (1994) discovered Chauvet cave in the Ardeche area of southern France, and to see the work of some of the earliest human artists--dating back as much as 30,000 years. 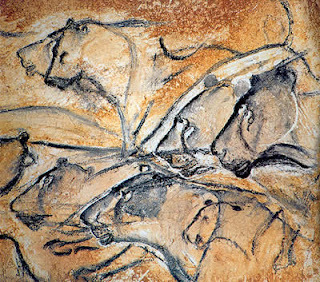 ... along with cave bears, hyenas, and antelopes, all drawn with comparable evocative skill. It's not known how many hands were involved in the making of these images, nor by how many centuries they may have been separated. It is known, however, that the cave was protected by a centuries-old collapse of the cliff face, burying it deeper in the mountainside and far from destructive light and other degradation. Still, the survival--and perhaps most of all the discovery--of this trove of ancient human artistry is astonishing. One wonders how much more about our evolutionary history remains undiscovered. 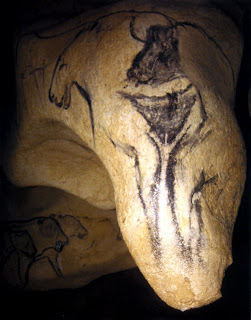 ... with spindly legs below and the upper torso and head of a bison painted on a phallic rock projection--clearly a significant departure from neighboring images and ritualistic rather than depictive. We'll never know what motivated this extraordinary artwork, but we can at least we grateful that it was discovered; and that we have a film maker with the vision of a Werner Herzog to document it with such scrupulous care. That artists were already painting masterpieces such as these thirty thousand years ago says much about the creative spirit the defines our humanity. It's good to remind ourselves, too, that there were no Christie's or Sotheby's back then, and no commercial galleries whose dominance tends to distort the intentions and purposes of those who make art. Did their skill assure them some special, perhaps shamanic place in their clan? It may be just as well that we have no way of knowing. That way, the mystery of these marvels stays intact, far beyond the reach of our rational minds. We can be awed simply by their beauty and by the unfathomable depth of their meaning. Heir to the intensity of personal survival and the absolute knowledge of the terrified hunter bloody and frozen numb by the fight and flight of the slain animal these images speak volumes. The days of colecting and fracturing powder and oil from local plants to firm the burned in image and smell of the instant and fleeting images leaping at them in the bright day and moonlight. No curator but the shamans ode. We watched the film just the other day, as well. The paintings are stunning. A beautiful communication. I saw this in 3D when it came out and don't think the 3D added all that much, actually, although I did love the film. The friends I saw it with were much more critical of Herzog's whimsical approach, but I think I felt: well, the paintings are weird and mysterious, so why not be more weird and mysterious, it's not out of keeping? (why not albino crocodiles? they're beautiful). My second experienc of 3D, Wim Wenders' film, Pina, about Pina Bausch and her dance company, was a much more interesting use of the medium and utterly enthralling to one who has always loved dance films and the feeling of being up so close to the dancers - if Carlos Saura had had 3D... Can't recommend it too highly if you haven't seen. Glad we're on the same wavelength, Robin. A nice serendipity. I first saw Pina Bausch (live) back in the 1980s, Jean, and have never forgotten the two extraordinary performances. I must look out for the Wim Wenders movie. Thanks for the referral. Isn't it a wonderful film? So glad you and Ellie saw it.